Gauri Gill, Untitled from the series Acts of Appearance , 2015 – ongoing. Gauri Gill, Untitled, from the series Acts of Appearance, 2015 – ongoing. Gauri Gill, Sunita, Sita and Nirmala from Balika Mela series. Archival pigment print, 28 by 42 inches. Gauri Gill’s solo exhibition Acts of Appearance (2015-ongoing), at MoMA PS1 knocks it out of the park. On entering the gallery we are confronted by masked individuals engaging in daily village life. A tiger headed housewife sits outside her adobe home and embroiders a quilt, while a man donned with a cobra’s head tends to his convenience store. This peculiar commingling of masquerade with the quotidian which raises question about who these people are and what they signify are the hallmarks of Gill’s recent body of color photographs. 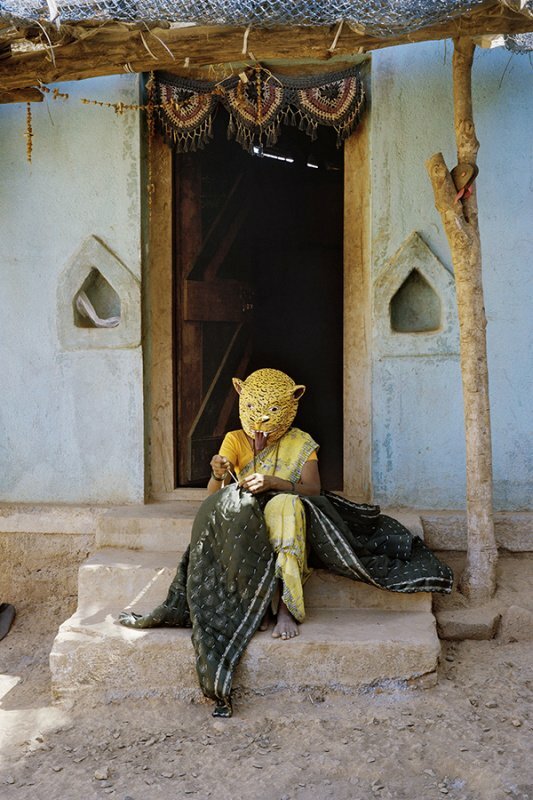 Although Gill is known for chronicling the lives of minority communities, Acts of Appearance, came about when she learned about the indigenous Konkan tribe in the Jawhar district of Maharashtra, India, and the Bahoda festival famous for its papier-mache masks. Inspired by the tribe’s mask making ritual of creating deities and mythological figures which are worn during religious occasions to reenact myths, Gill approached the local artists Subhas Dharma Kadu and his brother Bhagvan Dharma Kadu to collaborate with other members from their community to produce masks that reflected their daily lives. What emerged was an incredible cast of characters ranging from regular people to birds, animals, objects and celestial bodies that conveyed the tribe’s deep-rooted connections to their environment and echoed a highly subjective expressionist vocabulary of forms. The most significant aspect of Gill’s project is her collaborative effort with the wearers of the masks to stage scenes from their routine activities. It was an attempt, as Gill describes in the pamphlet accompanying the exhibition, for her subjects to “think about what happens when we choose to self-reflexively play ourselves out or enact the things we do unthinkingly most of the time.” But in the ensuing tableaus, which are as playful as they are telling, reality is often turned into something strange and expressive. For instance, in Untitled, (all from the series Acts of Appearance 2015 – ongoing,) a man and a woman sit on a bench. 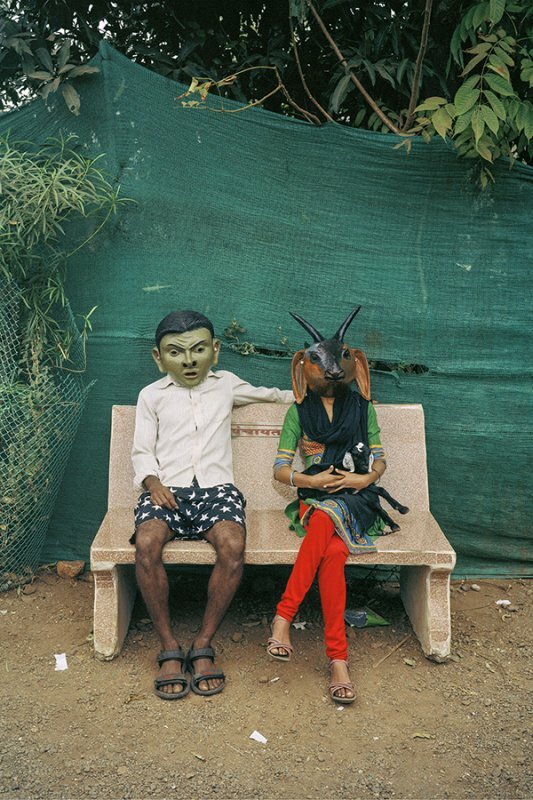 The man’s mask resembles a green-faced alien, while the woman wears a goat’s head as she cradles a baby lamb in her lap. The casualness of their stance—as if it’s perfectly commonplace to encounter surreal figures akin with domestic animals in their surroundings—brings a sense of mystery and contemporaneity to their craft and performance. Even more inspiring is the way the community’s quotidian lives are transformed into diverse tableaus of empowerment. 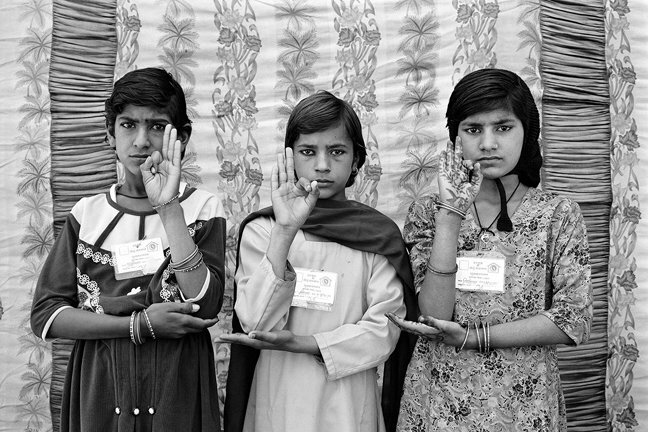 Previously Gill has spoken of her work as her effort to capture “the life of those rendered powerless by state forces and societal structures.” As in her prior Balika Mela (2011), project where Gill created a makeshift studio during a fair for young village girls in Rajasthan and urged the girls to decide how they would like to be represented in her photographs, here too we experience a similar kind of charge. 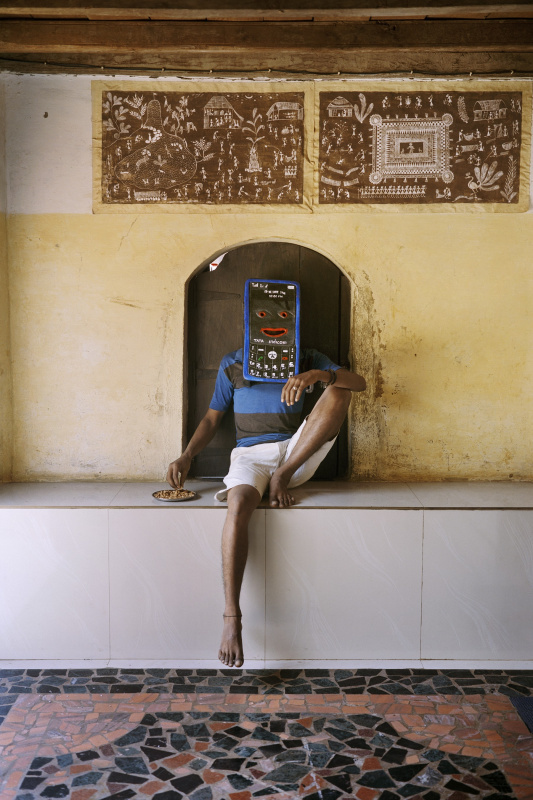 In Untitled, a man sits in an alcove decorated with local Warli paintings with his head covered by a mask resembling a cell phone. His carefree nonchalant posture and the infiltration of modernity seen through his informal western attire and use of a cellphone subvert one’s stereotypical associations of ritual and tradition with people from the hinterland. Yet ultimately it is the anonymity of Gill’s figures that heighten the constant interplay between tradition and modernity, high art and craft, and the performative enactment of daily life. Unlike the intimate portraits of her subjects in the black and white photographs from her ongoing series Notes from the Desert (1999) – that are placed alongside the images from Acts of Appearance, in the exhibition, the masks enable the community to portray their lives incognito and create a venue for their voices to be heard collectively. In Untitled, for example, two men and a woman wearing masks of a rabbit, a monkey, and an owl sit in what appears to be a classroom under a sign written in Marathi that translates as laugh play but be disciplined. The signage is a perfect illustration of what the show hopes to achieve. It indicates that even as the characters playact different personages and might be seen as jokers, satirists, or symbolists, they are deeply invested in portraying the reality of their surroundings. So the eagle headed woman who sweeps her front yard, or the elephant headed doctor who tends to his meek frightened looking patient with basic medical equipment present the tribe’s meager conditions and way of life from a communal depersonalized point-of-view. Acts of Appearance is compelling because of the marvelous relation between the masked actors and their actions. It makes the lives of the Konkan tribe even more prominent in a strange fashion. But in doing so it also hammers home the significance of acknowledging multiple perspectives of reality as we attempt to unpack the shifting meaning behind each tale. Gauri Gill earned a BFA in Applied Art from the Delhi College of Art, New Delhi, and a BFA in Photography from Parsons School of Design, New York, before going on to do her MFA in Art from Stanford University, California. She is currently based in Delhi where she lives and works. She was awarded the Grange Prize in 2011, Canada’s foremost award for photography. Gill’s complex practice contains several lines of pursuit, including a more than decade-long study of marginalized communities in rural Rajastan that resulted in several bodies of work, including Notes from the Desert, Jannat, Balika Mela, Birth Series and Ruined Rainbow Pictures. She has explored human displacement and the immigrant experiences in series such as The Americans and What Remains. Projects such as the 1984 notebooks highlight her sustained belief in collaboration and ‘active listening’, and in using photography as a memory practice. Her most recent series, Fields of Sight, is an equal collaboration with a renowned folk artist, combining the contemporary language of photography with the ancient one of Warli drawing to co-create new narratives. Working in both black and white and color, Gill’s work addresses the twinned Indian identity markers of class and community as determinants of mobility and social behavior. Her work is characterized by her sense of empathy, surprise, and a human concern over issues of survival. Her photographs have been exhibited in several leading institutions, including the Whitechapel Gallery, London; Art Gallery of Ontario, Toronto; Herbert F. Johnson Museum, Cornell University; Philadelphia Museum of Art, Philadelphia; Yale Art Gallery, New Haven; JNU School of Arts and Aesthetics, New Delhi; Salzburger Kunstverein, Salzburg; and the National Gallery of Art, Warsaw. More recently she held solo shows at Galerie Mirchandani + Steinreucke, Mumbai, Thomas Erben Gallery, New York; Experimenter Gallery, Kolkata, and the Wiener Library, London. Gauri’s work is part of prominent North American and Indian collections, including the Freer and Sackler Galleries of Art at the Smithsonian Museum in Washington DC, the National Gallery of Canada, Ottawa, Devi Art Foundation, New Delhi, and the Fotomuseum in Winterthur, Switzerland.